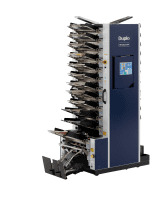 The Esper DM-230V Direct Mail Collator has been designed to meet the growing demand for organizing assorted marketing literature. Sets incorporating a range of materials such as leaflets, brochures, and postcards can be quickly collated and wrapped around with a cover ready for distribution. The Esper features low noise, low energy consumption, a small footprint, and 23 feeding stations. 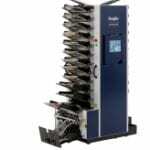 The engineering of the collator ensures accurate feeding and delivery of sets time after time.